Elegant and intricate, our Traditionally Sweet table cards boast a striking border combined with an ornate array of Victorian scrolls and finials throughout mingled with a beautifully contrasting white and brown color scheme. Add your personal touch with one of our beautiful wedding font options to complete the design. 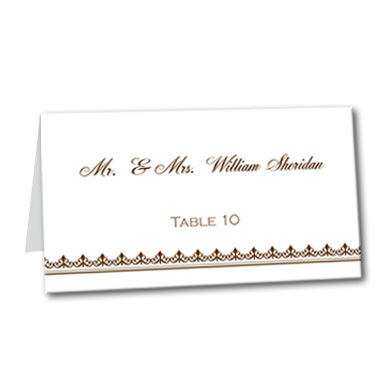 Traditionally Sweet Table Card For the best experience, we recommend personalizing your stationery on a desktop computer.